Mini trampolines are back in the news. With more people dropping their gym memberships in times of economic downturn, we`re all looking for ways of keeping fit at home, without breaking the bank. The mini trampoline is an answer to this problem and has spawned a whole new raft of exercises to help tone and energise. People have taken the exercises they learned at the gym and combined them with their own home equipment. So just what are the benefits of mini trampoline exercising and how can we use this equipment to best effect? There are plenty of advantages to using mini trampolines for a workout. They help increase the circulation of oxygen around your body, releasing energy and waking up your system; they increase lung capacity, strengthen the heart and stimulate the metabolism; mini trampolines are easy on your joints, allowing you to exercise more safely, for longer. All forms of exercise are good for your overall health, but those who need to take things more slowly particularly enjoy using this equipment, as they can work at their own pace, in comfort and have fun at the same time! Often we overlook the `fun` element of exercise. If you are highly motivated exercise is an end in itself; for others, it is a necessity and with the best will in the world it can become tedious. Mini trampolines seem to bypass this negative thought spiral it`s almost impossible to work out on a trampoline without smiling, which could explain their enduring popularity. Perhaps it is the association with childhood, or maybe just feeling lighter and more comfortable. 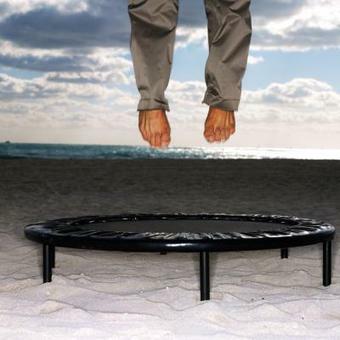 Whatever the reason, your mental wellbeing can benefit from a mini trampoline workout as well as your body. Focusing on physical workouts, let`s look in detail at an exercise that has been transferred from gym to home in recent months and see how people have adapting it to the mini trampoline. The squat has long been a part of the daily workout for dedicated gym queens. It`s tough, but you know you have to do it if you want a toned core and legs. This exercise, when done on a mini trampoline, actually works out even more muscles than if it is done on a hard surface, as your body works to stabilise you. You may find muscles you didn’t know you had aching after this exercise. Start with your feet shoulder-width apart with toes forward. Bend your legs so that the knees are at 90 degrees, keeping your back straight and chin up. Push down on the heels as you return to a standing position. If you want to add an extra level of difficulty to the exercise, hold a weight in front of you as you do your squats, but make sure you have practised without one first. It takes some time for your muscles to `remember` how to stabilise you on a trampoline, so don`t think you can just hop on for the first time and complete a full gym workout from a standstill. Be kind to your body, take your time, relax and enjoy a whole new way of exercising. You don`t have to miss out on the social aspects of the gym when using a mini trampoline. Get together with friends and buy the equipment online at outlets such as www.trampolinepad.co.uk and start your own mini gym together. There may be more laughing than exercising at first, but it really is a new craze for good reason. Fun and fitness? Sure you can have both.